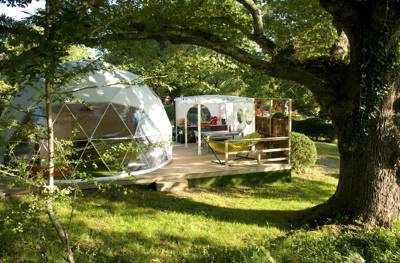 This spacious, space-age geometric dome provides modern glamping on a site in South West France. Inside, these Domes are well thought out, with a separate living area including 'Fat Boy' bean bags to lounge around on, a master bedroom with a huge King sized bed, and a separate bedroom with two 'hanging' beds for the children. Next to your Dome there is a separate kitchen tent with al fresco dining area, and a 'plancha' (like an express BBQ!) for you to cook your meals on in no time. Shower and toilet facilities are a short walk away. These standard domes sleep up to 6 people in total, with a maximum of 4 adults.